At Palmer Custom Jeeps by SORS, we are the experts in all things jacked-up jeeps. Whether you’re in Fulton County, DeKalb County, Gwinnett County, Cobb County, Clayton County, Douglas, Fayette, or Henry County, Palmer Custom Jeeps is the solution. At our state-of-the-art facility, we create one-of-a-kind jacked-up Jeep Wranglers that perform as well on the road as they do off road. Simply put, we are the premier lifted Jeep dealership in the Metro Atlanta, and we specialize in Jeeps. 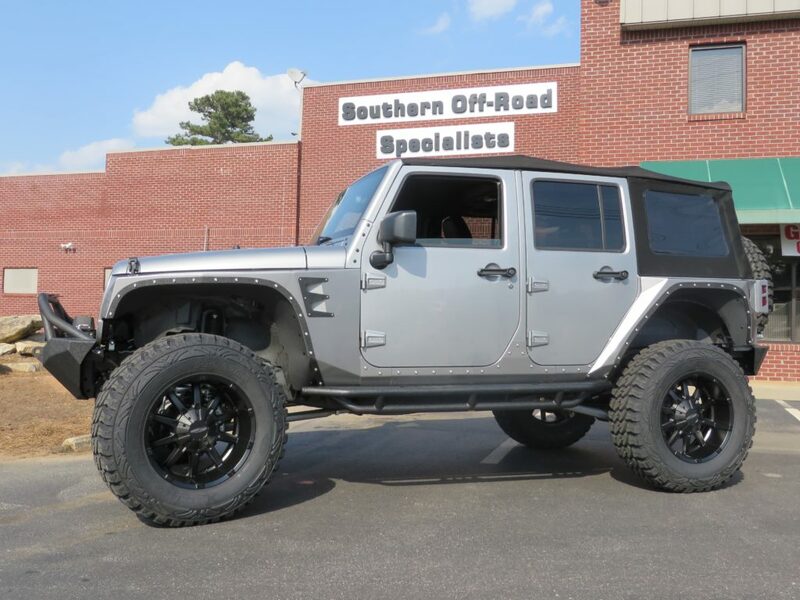 If you’re looking for a new jacked up Jeep Wrangler in the Atlanta area, Palmer Custom Jeeps by SORs offers an entire fleet of the newest and most stylish Wranglers. We offer several lifted Jeep Wrangler Unlimited Sport 4×4 that are designed to cruise through the toughest Georgia trails. You can also find jacked up Jeep Grand Cherokees, custom Jeep Cherokees, lifted Jeep Patriots, and virtually every other make and model. Browse custom Jeep Wranglers, Patriots, Renegades, and Grand Cherokees at Palmer Custom Jeeps by SORS. If you need immediate assistance, do not hesitate to give us a call at 888-230-6806 for immediate assistance. Since everyone isn’t in the market for a new jacked up Jeep Wrangler, Palmer Custom Jeeps by SORS is sure to offer several moderately-priced used lifted Jeep Wranglers. Many of our used custom Jeeps are equipped with cutting-edge accessories and have low miles. Whether you’re looking for a used lifted Jeep Wrangler for sale, used lifted Jeep Grand Cherokee for sale, or any other model of Jeep, trust the experts at Palmer Custom Jeeps by SORS to deliver. Browse our inventory of lifted Jeep Wranglers at Palmer Custom Jeeps by SORS. Do you already own a Jeep in the Metro Atlanta area? Are you looking for new ways to elevate your Jeep enthusiasm? You’ve come to the right place! At Palmer Custom Jeeps by SORs, we are the Jeep specialists. We have partnered with the leading manufacturers of Jeep equipment to create one-of-a-kind custom Jeep Wranglers, Jeep Patriots, Jeep Renegades, Jeep Grand Cherokees, and more. As the best custom lifted Jeep shop in Atlanta, we will guide you through the process. Browse through our Custom Jeep for off-road inspiration and innovative ideas. Elevate your passion for off-roading with a lifted Jeep Wrangler from Palmer Custom Jeeps near Atlanta. Whether you’re in Fulton County, DeKalb County, Gwinnett County, Cobb County, Clayton County, Douglas, Fayette, or Henry County, Palmer Custom Jeeps is the solution. Complete our online contact form and tell us more about your needs, or you can call us directly at 888-230-6806 for immediate assistance. \We are conveniently located at 11460 Alpharetta Highway in Roswell, Georgia 30076. © 2019 Palmer Dodge Chrysler Jeep RAM.